Real Skateboards, Green Issue, Autobahn wheels and Tribute skateboards: four skateboard companies helping Japan. The folks at Real skateboards have been putting their weight behind some great causes forever. Through their Actions REALized program, Real is able to produce decks and give the proceeds to causes and people in need. In the wake of the natural disaster and ensuing tragic events in Japan, Real decided to lend a hand the best way they knew how. 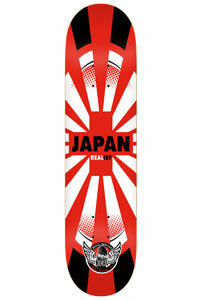 With their Japan Realief deck, all proceeds from sales of the deck, less the cost of production, go directly to the Red Cross's relief efforts in Japan. "Like the rest of the world we were watching the efforts unfold the night the earthquake and tsunami hit. It was surreal. As skaters, we have friends worldwide and many, many friends in Japan. It was incredibly tough to watch the devastation and not know if our friends were ok, let alone all the Japanese people caught in it. When I got in to work the next morning Mic-E Reyes simply said 'we have to do something now' as he had watched [the tragedy] unfold all night. From there it was just a mad scramble to try and make it happen as quick as we could." From that point on, the folks at Real and their umbrella company, Deluxe distribution scrambled to get an Actions REALized deck into production and out the door to benefit relief efforts as quickly as possible. Artist Chris Wright designed the graphic on the fly while juggling dad duties with a newborn at home. A webpage was built and the board was in production within a day. Actions REALized, which has been ongoing at Real skateboards for some time, is an extension of what Real, as a brand, has been trying to do since its inception. Thiebaud makes clear that Actions REALized isn't a publicity stunt or a grab for attention. In his own humble way, Thiebaud explains that it's just their way of pitching in. "I really don't ever look at Actions REALized as a campaign or innovative or anything like that," says Thiebaud. "It is simply part of what we've always done, which is to use this gig to try to do good stuff, uplift riders, give back to skateboarding and do our part." To find out more about Actions REALized as a whole or to purchase a Japan REALief board directly, go to the Actions REALized site. By the same token, offering help to Japan in these times of great disaster and anxiety is en vogue this week. 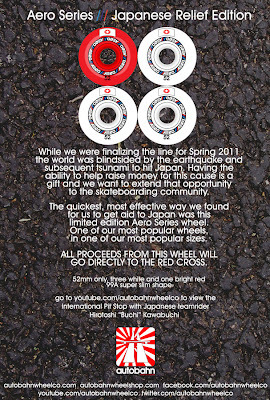 Tribute skateboards is also helping the cause with their “Tribute Takes Tokyo”. Several tee shirts, originally planned as promotional items for the crew’s recently canceled tour are available on the website. Available in black, white, or red, 100% of the proceeds from each tee shirt go directly towards Japan relief through Mercy Corps. Elsewhere, Autobahn has also offered their Aero Series/Japan Relief Edition wheels with all proceeds going to the Red Cross (though the wheels are coming without the abec 5 bearings). Also see Green Issue that is issuing a tee shirt for Japan. No matter how large or small is significant, your donations will surely help to make a difference in someone’s life that has been changed forever.